Oops - we don't appear to have a video for the ScanJet 5000. Manage all your office scanning processes with this fast, easy-to-use business scanner. Automatically capture stacks of single or double-sided documents and streamline common tasks such as saving, filing and organising scanned images. Fast document scanning for your everyday needs. 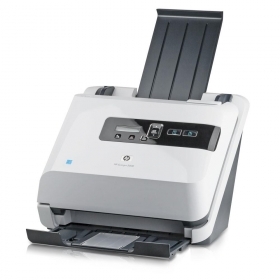 Capture documents in black, greyscale or colour at up to 25 ppm/50 ipm1 with this easy to use simplex/duplex scanner. Experience reliable unattended operation with 50-page automatic document feeder and handle volumes of up to 1,500 pages a day. Streamline everyday scanning tasks using programmable, easy-to-access scan profiles. Streamline processes using HP Smart Document Scan Software. Create customised scan profiles, preview and edit scanned images, save in a wide range of file formats including PDF and Microsoft Word, and send directly to email, folder or application. Get started with document management today. Create a document management solution out of the box with ScanSoft® PaperPort®2, or integrate into an existing system using ISIS®, TWAIN and WIA drivers. Convert scans into editable text with IRIS Readiris Pro OCR software.